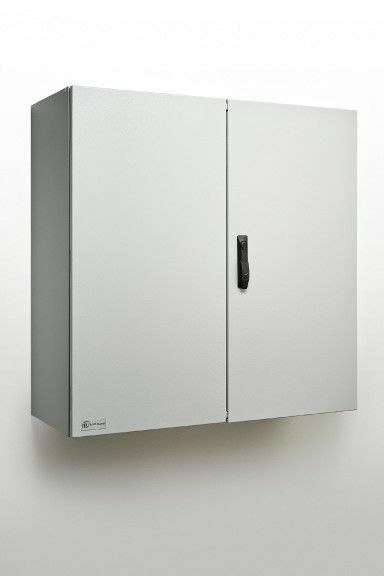 Our wall mounted steel electrical enclosures are suitable for most applications. You can install this enclosure indoor or outdoor. This is our most common electrical enclosure. In fact, we have supplied thousands of these throughout Australia and have exported throughout the world. Customers prefer to use IP Enclosures more than any other enclosure they have used. Why? Our standard enclosures are higher quality than many others. For example, we use galvanised steel sheet and then powdercoat to prevent rust and corrosion to provide greater protection in harsh conditions. We also pack our standard enclosures with premium features. They are fitted with nutserts so you do not need to drill holes for mounting brackets and accessories which retains the integrity of the IP rating. The formation of the body provides a flat surface for the seal to activate to ensure a long seal life. Also, our quarter turn locks are chrome steel, not plastic. A full range of accessories are easily fitted without the need for drilling. These are just a few of many examples of why customers prefer IP Enclosures. IP Enclosures are tough to ensure protection in the toughest conditions. We design in Australia and manufacture in Europe to high quality standards. These are high quality enclosures packed with premium features at a competitive price. So if you are after the best value over the life of the enclosure, this is the enclosure for you. Conforming and certified to IEC 62208 – ‘Empty enclosures for low voltage switch gear and control gear assemblies’. A full range of locking solutions are available upon request. – 3mm double bit insert quarter turn lock with key. The robust monoblock body is 1.5mm galvanised steel sheet. Precision automated manufacturing equipment ensures accuracy and consistent high quality. Flat face sealing surfaces increase seal life. Pre-fitted blind nutserts for mounting brackets and accessories removes the need for drilling. This retains the integrity of the IP rating. Integral device plate mounts and M6 earth stud are included. A galvanised steel gland plate is also incorporated into the bottom face. – 3 point locking system with key-lock swing handle.